Of all of the places to fish in the United States, few can even remotely compare to the icy blue waters of our northernmost (and largest) state. Fishing isn't just a hobby here- it's a way of life. A fishing trip to Alaska is a journey into the past. Enjoy breathtaking vistas untouched by man, beautiful wildlife, and nature in its purest form. And after when you're done for the day, return to the lodge, hop into a soft bed, and rest up for another expedition tomorrow. If you seek thrilling adventure, indescribable natural beauty, and -above all else- big fish, then one of these might be right up your alley. At Jimmie Jack's Fishing Club you have an Alaskan paradise at your fingertips. Experience it how you will- boating, hiking, relaxing, or, of course, fishing! Alaska Fishing Charters always comes with awesome boats, gear and captains, in addition to meal packages that will leave you free to focus on reeling in the big one. Once you're out there, you'll be fishing for Kenai River king salmon, Kasilof River king salmon, Pacific halibut, monster lingcod, black rockfish, yellow-eye rockfish, sockeye salmon, trophy rainbow trout, and silver salmon (among others). Of course accommodations are warm, rustic, and luxurious as well. Add it all together and you have a fishing trip as memorable as any in the world! The lodge has plenty in the way of all-inclusive meals for breakfast, lunch, and fine-dining in the evening. There's also complimentary wine, drinks, and appetizers. 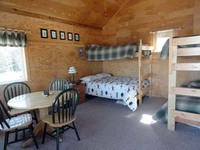 Glacier Bear Lodge offers unmatched fishing and outdoor adventures in beautiful Yakutat. Never heard of it? You should have! Set against the crystal clear Situk River, anglers of all skill levels will appreciate the incredible service, accommodations, and location offered by Glacier Bear Lodge. The premium runs of Steelhead and Salmon make for fantastic fishing throughout the spring, summer and fall. Meanwhile,each of the lodge's 31 rooms features two double beds, one rollaway bed, and a full private bathroom, easily accommodating even the largest of families. The lodge outfitters are there to make sure you have everything you need for a successful getaway. All-Inclusive packages are available, and you can grab things you need along the way from the tackle shop. Getting to Glacier Bear Lodge is simples, as Alaska Airlines flies through Yakutat twice daily. The lodge has drift boats that will take you on a 14 mile drift down the most beautiful river in Southeast Alaska! Let Alaska's Gold Creek Lodge's friendly and knowledgeable staff show you a superior way to vacation- and the best way to fish! Approximately 280 miles from Anchorage, and nestled snugly within the Bristol Bay watershed, Gold Creek invites guests to experience their unique brand of fishing. From the banks of the world-famous Naknek River in beautiful King Salmon,you'll settle into your rustic lodgings, then hop into a float plane and head out to the southwestern peninsula (which is only accessible by air). The Naknek River is boasted by Fish Alaska Magazine as “the best rainbow trout fishing in Alaska,” come and allow the friendly guides to show you precisely why! King Salmon is service and shipment center for the commercial red salmon and sport fishing industries. Who'd of thunk?! In the 1930s, the U.S. government built an air navigation silo at the site of present-day King Salmon. Looking for an incredibly personalized experience for you and a small group? The Northwoods Lodge could be right up your alley. This small, family-owned business is based in the village of Skwentna, Alaska, and takes pride in their personal service, dedication to good fishing, and unbridled hospitality. Most of the fishing at the Northwoods lodge is done from the river bank, back trolling, or wading out from mid-stream shallow areas. While other Lodges might rent out big boats or take float planes to remote locations, the proprietors of Northwoods think that the absolute best fishing is done right where they are. 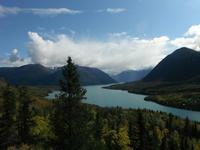 The Lodge is located on Fish Lakes Creek, but fishing is also done at the nearby Lake Creek and Yetna Rivers. Salmon is the primary target here, but fishing for trout, grayling, and northern pike are all options as well. Interested in fly fishing, but never done it before? The Northwoods Lodge will has several G-Loomis fly rods, and your personal guide will be more than happy to show you the ropes. The cabins are modest, but quaint, and more than enough for a vacation where you'll be spending a majority of your time outside. Imagine you, your guide, and three of your best friends knee deep in a glacier-fed crystal-clear stream, hearing the occasional tapping of a woodpecker and swish of a cast. And nothing else. Serenity is tough to find, but Northwoods Lodge is a great place to start. Believe it or not, when measured for the 2010 census the population of Skwenta was 37. The lodge is situated 144 feet above sea level. Want to go on an authentic Alaskan fishing trip, but don't want to break the bank to do it? Look no further than Gwin's Lodge. Located near the tip of the Kenai Peninsula and at the confluence of two world-class Salmon fisheries, Gwin's is a fantastic place to make your home base as you explore the multitude of things to do in the area. Fondly referred to as Alaska's playground, the Kenai Peninsula is host to a seemingly endless list of fun activities to do and sport to partake in. The friendly Gwin's staff will be more than happy to assist you plan out your days and recommend what's been popular in the past. Try your hand at ocean kayaking, get some adrenaline going while white water rafting, or take a brisk trot around a nearby national park on horseback. Whatever you feel like doing, Gwin's will do their best to facilitate it. Of course, the real draw here is fishing, and Gwin's prime location means that you'll have no trouble getting to the most popular spots before anyone else. The term "combat fishing" originated here describing the "combat" fishers engage in to get space at the most crowded fishing spots. If people are roughhousing a bit too much for your taste, head back to one of Gwin's 15 cozy cabins, available for groups large (10) and small (2). Cooper Landing is approximately 69.9 square miles. 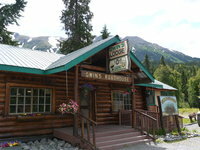 Gwin's Lodge was actually built from spruce logs harvested from the surrounding Chugach National Forest. Pat and Helen Gwin cut, hauled, and hand-peeled the logs themselves. They opened the lodge on January 1, 1952. All of the Lodges on this list have a few things in common. They're all surrounded by beautiful environments, they all have gracious and hospitable staffs, and they all have fantastic fishing (obviously). So what makes Favorite Bay Lodge stand out from the other nine fantastic lodges on this list? Lots, but primarily whale watching! While there are around 1100 islands in the Alexander Archipelago (SE Alaska), Favorite Bay Lodge's Admiralty Island stands apart. It's the seventh largest island in the US, and is mostly covered by the Admiralty Island National Monument, an area permanently protected from development by the Alaskan Government. 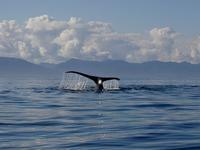 To the west of the island is the Chatham Strait known for its huge population of Krill. And what eats Krill? Humpback whales eat Krill! Favorite Bay Lodge provides fantastic accommodations for whale watching, conveniently just minutes from the lodge itself. Killer whales and porpoises feed in the area! When both Discovery Channel and National Geographic have filmed here, you know it's going to be spectacular. Of course, the fishing at Favorite Bay is as excellent as you would expect from a premier Alaskan lodge. They offer both salt and freshwater experiences, and with a guides help no Halibut, Salmon, or Rockfish will be safe from you. As for accommodations, Favorite Bay Lodge believes in roughing it, but only to a point. All of their 12 individually designed guest rooms are decorated and named for our native Southeastern wildlife. You'll feel like you've died and gone to Alaskan heaven! Admiralty Island is 1,646.4 square miles. Admiralty island has the highest density of brown bears in North America. They bears outnumber the people almost three to one! Relish every moment with the "Trip of a Lifetime" to King Salmon, Alaska, and Alagnak Lodge. A convenient location between the Alagnak River and Bristol Bay offers anglers of all skill levels an unforgettable adventure. Bristol Bay is home to one of the world's largest salmon runs, and it's estimated that millions of wild salmon pass through the region each summer. The Alagnak River has long been recognized as one of the finest sport fishing rivers in all of Alaska. Some of the finest fishing holes along this stretch of water are conveniently located within a ten-minute boat ride of the Lodge, both upstream and downstream. As if the unmatched fishing waters wasn't enough to draw you into this unique lodge, Alagnak also features fly-out fishing options, boats, guides, incredible dining options, and comfortable accommodations. Whether you are looking for a single room for one or two people, or a larger group option for your entire family, Alagnak Lodge has you covered. It's time to start planning your own Alaskan salmon fishing adventure! Spinner fishing isn't you're only option when planning a trip at Alagnak Lodge. Fly fishing and spey fishing are also popular in the area. The expert guides will show you the ropes if these fishing types are unfamiliar. Fishing isn't the only activity you'll enjoy during your next trip to Alagnak Lodge. They also offer sightseeing and photography opportunities for travelers looking to capture unforgettable moments. The Alagnak River features runs of all five species of Pacfic salmon, a feat that's even rare in Alaska. There are normally two or three species in the river during the prime summer fishing months. Filled to the brim with Trophy Rainbow Trout, Arctic Char, Silver Salmon, King Salmon, Sockeye Salmon, Grayling, and more, the waters around Alaska Rainbow Lodge are as colorful as its namesake! Featuring easy access to more than 30 different rivers and streams all teeming with fish, a stay at Alaska Rainbow Lodge is one you'll never forget! Incredible fishing can be found across 3,000 square miles of the Iliamna-Katmai watershed into Bristol Bay. There’s simply no such thing as a bad day of fishing at Alaska Rainbow Lodge! Guides can assist you in finding the best spots and techniques for reeling in "the big one"- meanwhile the gorgeous quarters you'll be residing in are fit for royalty, and are the perfect place to cap off a successful day on the water! Each plush, carpeted, soundproofed bedroom here also has a large private bath! The fishing lodge has thermostatically controlled forced-air, heat and 24-hour electricity. The Kenai Peninsula isn't called "Alaska's Playground" for no reason! At Kenai River Drifters Lodge you'll quickly become lost in the beauty of the majestic Kenai River- of course your swanky accommodations help in that regard as well! Here you'll search for Alaskan wildlife, both on land and sea. and feel your jaw drop in awe of the breathtaking Chugach Mountains. 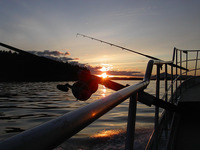 There's nearly infinite number of ways to enjoy yourself in the Kenai Peninsula- so why do so many go fishing? Because, simply put, it's the best there is. Salmon are sizable and delicious, while the guides are friendly and knowledgeable. All this put together make Drifters Lodge a can't-miss Alaskan opportunity! The lodge is two minutes' walk from shops in Cooper Landing and three miles from Juneau Creek Falls. There's a deck with BBQ grills, and a sauna with river views. Elfin Cove Resort has one goal: to give anglers and sightseers a vacation they will never forget. They'll go to any length to succeed in that goal! The only way to understand the natural beauty surrounding Elfin Cove is to see it for yourself. And there's simply no better spot to observe it than in the middle of the cove with a fishing rod firmly in hand. The surrounding area sports ginormous Pacific halibut (ranging from 20 lbs to over 300 lbs) and all types of salmon, from King to Sockeye. From the moment the floatplane sets down until you reluctantly leave for home, you will absolutely love becoming part of Elfin Cove's Alaskan Family. Fish aboard one of the lodge's six boats, ranging from 30 to 36 feet. The onsite professional fishing guides are all seasoned sport fishers who enjoy getting guests "into the bite"! Overlooking the spectacular view of the Bay and pristine Wolverine Creek, Yes Bay Lodge is nestled in the heart of The Tongass National Forest. It makes for a stunning backdrop while you fish! Yes Bay's unique location gives it unprecedented access to the many prime fishing spots in the area! Prime spots are just 20-25 minutes away at most, and your professional guide will show you what species are running and give you the most opportunity to get your limit. Salmon, halibut, ling cod, and several species of nice rock fish are plentiful- simply head out on a custom built, canopy covered boat and get to it. You'll return to cozy comfort and sublime surroundings at Yes Bay! 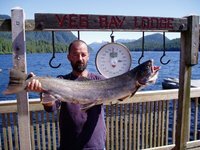 Yes Bay Lodge lies fifty miles north of Ketchikan in southern Southeast Alaska. Yes Bay Lodge has been owned by the Hack Family since 1977! Beautiful lodges in Alaska are a dime a dozen; it literally comes with the territory. But fantastic service isn't nearly as common. 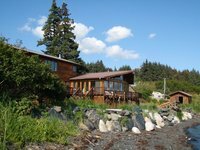 Enter the Sportsman's Cove Lodge, located on scenic Prince of Wales Island in southeast Alaska. Consistently ranked among Alaska's best lodges, the Sportman's Cove Lodge has a commitment to excellence that is unmatched. It's this commitment that explains why 85% of the Lodge's customers have been there before. The fishing, suffice to say, is spectacular. Multiple types of salmon, halibut, and cod are plentiful, and whatever you catch will be filleted for you by your personal deckhand for your consumption later. After fishing, immerse yourself in the Tongass National Forest, the country's largest, and make sure to keep your eyes peeled for black and brown bears, American bald eagles, and Sitka black-tail deer. If you're exhausted at this point (certainly understandable), head back and hit the hay in one of the many authentic hardwood cabins. If you love the outdoors Sportman's Cove Lodge is for you. Ketchikan is the rainiest city in the Tongass National Forest. It receives an average of 13.5 ft of precipitation annually! Prince of Wales Island is actually the third-largest island in the United States. It's more that 2600 square miles. Yes, there is a port in Port Lions. No, there aren't any lions in Port Lions. What there is is some of the best fishing, lodging, and hospitality in Alaska. Set on the north coast of Kodiak Island, Port Lions Lodge is a luxury fishing lodge that offers comfortable accommodations, first-class dining, and breathtaking views of surrounding Kizhuyak Bay and the Kodiak Mountains. Yes, there are comfy cabins and cozy rooms, full of things to keep you warm in the harsh Alaskan winter, but you’re here for the fishing of course! The Kodiak halibut, Kodiak salmon, Kodiak rockfish, and Kodiak lingcod are teeming and delicious. You'll motor out on a boat and spend the day talking, relaxing, and enjoying the scenery. Just remember to keep your eyes peeled for humpback whales, orcas, and sea lions! You can also enjoy hunting for Sitka blacktail deer, sea ducks, whale watching, Kodiak Bear viewing, berry-picking, hiking, sea kayaking, and more! Look out for arctic foxes, Sitka deer, and bald eagles! While "Ninilchik" might be a headache to say, the fishing at the Deep Creek Fishing Club is anything but. Whether you like salt water, fresh water, or want to fly to a more secluded area for some good ol' fly fishing, Deep Creek will cater to all your fishing needs. When discussing what makes the Deep Creek Fishing Club great, the proof is in the pudding, or rather, the name. The fishing at Deep Creek really is extraordinary. As the Lodge is located on scenic Cape Inlet, ocean access is easy. Simply jump on to one of the Club's gorgeous 28-foot cabin cruisers and try your hand at landing a monstrous halibut (which can weigh up to 300 lbs!). If you'd prefer a little river fishing instead, Deep Creek hosts 40 of the best glacier-fed streams in Alaska. Stacked with salmon and trout, choose this path and you'll be eating like a king come nightfall. Or perhaps you're a trailblazer, and want to conquer new territory. Hop onto a float plane or helicopter and go anywhere in a 200-mile radius. See something no one has ever seen before -- that'll be a story to tell the kids! For the traditionalist, go out and enjoy the chase with some fly fishing. And at the end of the day, return to your oceanfront villa and recharge for the next day. Is that fish I smell, or adventure? It's hard to tell at Deep Creek Fishing Club. Deep Creek Fishing Club also offers bear viewing and photography. Participants take a helicopter to one of the few non-commercial bear viewing areas in the area. It's not unusual to see 30-50 bears in one day! More than 40,000 Bald Eagles call Alaska home. Some might say that makes it the most American state in America! At Summit Lake Lodge, it's all about you. Fish whatever time of day you would like- there's no stress or hurry to be found! People flock from all across the country to throw a line in at Summit Lake Lodge! This historic Alaskan log lodge in the heart of the Chugach National Forest is the perfect place to escape the hustle and bustle of everyday life. Enjoy top of the line fishing gear and Coast Guard inspected vessels! The expert staff will be more than happy to share fishing secrets to help you snag some fish. Travel into pristine alpine lakes or rivers and fish for Char, Dolly Varden, Rainbow Trout, and Grayling. Afterwards return to your accommodations for some well-deserved rest and relaxation after a hard day's work!